A dobby mechanism is used to program the harness combinations for the weave pattern. Dobby is short for “draw boy” which refers to the weaver’s helper. The weaver don't have to make a choice between many harnesses for every shed opening he wishes to make. This work is simplified by using a dobby. The mechanical dobby has a drum with program bars. For each combination of harnesses, you have a program bar with 16 holes (one for each harness). If you want a harness to be raised, you place a peg in the corresponding hole of the program bar. After a pick, the program drum rotates slightly and the following program bar is set in front of the mechanism. Through a treadle, the selected harnesses are pushed up. 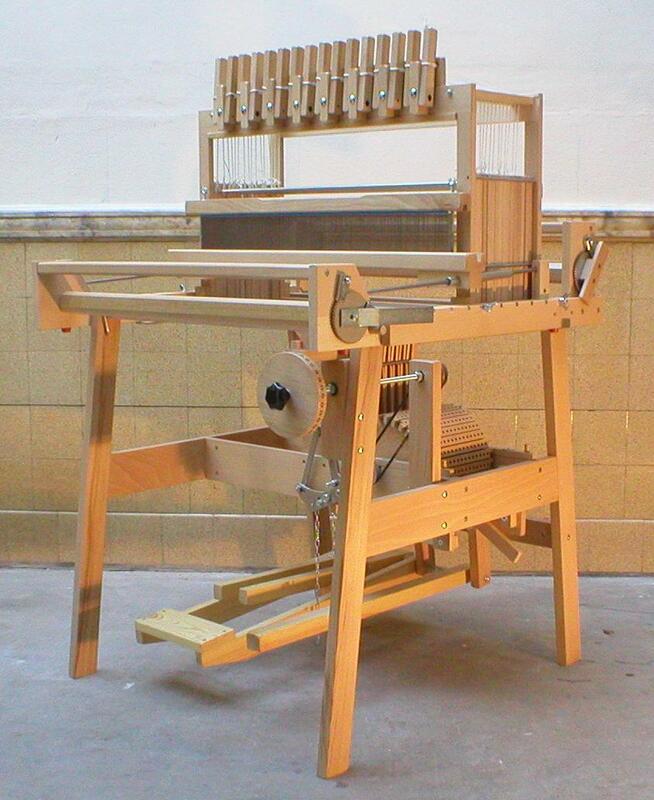 The 'Meta' dobby is build in a floor stand on top of which fits the common table loom with 16 harnesses. You can fix the loom 4 small hooks. It is always possible to pull up the harnesses with the levers. The dobby has a drum with 32 program bars. 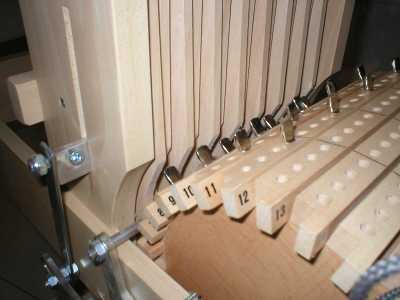 You can take out the drum easily, so placing the pegs is simplified. 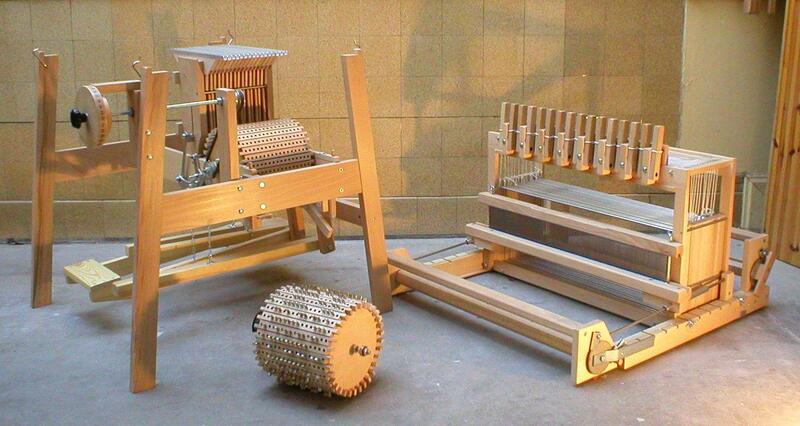 In front of the loom, there is a hand wheel with numbers (1 to 32), so you can see which is the current program bar. Turn the hand wheel to the desired position, the drum will rotate bringing the right program bar in front of the mechanism. Push the treadle on the right and the selected harnesses will raise. After weaving a pick you can release the treadle. On the left side there are two small treadles which rotate the drum: one treadle to choose the following program bar, one to choose the previous bar. 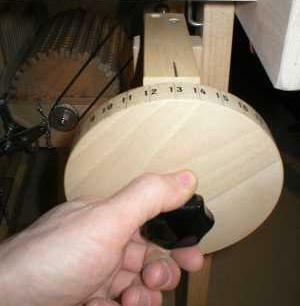 Push the left small treadle so that the drum rotates counterclockwise. Then push again the big treadle on the right and the following selection of harnesses rises. Weave a pick, release the treadle, push the left small treadle for the following selection, and so on. Suppose you want to make a weave with block pattern and one block counts 5 repeats of 4 picks. Suppose you want to make a herringbone twill (e.g. the twill line reverses direction after 8 picks). Weave 8 picks using the small treadle on the left. When the twill has to reverse, use the right small treadle to turn the drum clockwise after each pick. With one drum, you have 32 different harness combinations (32 different picks). When you need more, you can weave the other picks using the levers in front of the loom. Another option is to buy a second drum, changing the drums is very easy.